When I visited Bali I was very struck by the natural beauty of the Island as well as the integral part that religion played in the lives of the Balinese. The Balinese predominantly believe in Hinduism, they practice a very ritualised and visual version of this, incorporating local spirits and past times. I depicted a temple as they are around every corner in Bali and are so intricate and impressive. The Balinese use colours to symbolise different gods, I therefore limited my palette to Black (Wisnu), White (Iswara), Red (Brahma), Yellow (Mahadeva) and Green (Sangkara), these mixed together make Siwa the god of everything, they are also the colours often used in their religious offerings. 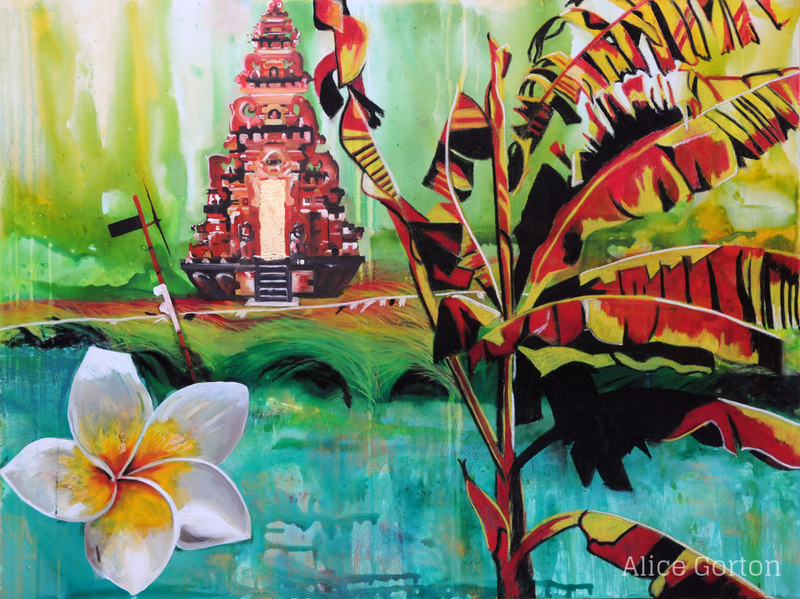 I wanted the painting to capture the exotic and striking flora, so I incorporated the backdrop of a rice paddy, as well as the banana tree and the frangipani flower, all of which were prevalent.